Christmas craft number one is 50% finished. Once I get going, it goes together quite quickly. It's that initial inertia to get started. I found that I do appreciate the background noise of the TV as I work so there was football on all afternoon yesterday. I'm also trying to make the item a bit distinctive. In Aunt Adele's trim box, there was this bit of lace. I have no idea from what it came. It's just a small triangle. I'm sure it has to be "old" in a sense that perhaps it was lovingly cut from a dress or maybe an antimacassar that had seen better days. I have no story other than it once belonged to Aunt Adele. 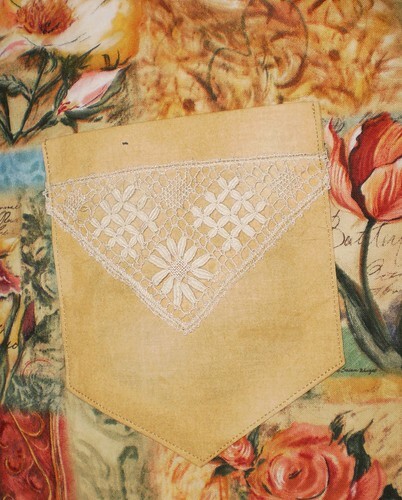 When I was thinking about this piece, which is going to Carole, I knew the lace would be perfect to grace the pocket. I'm very happy with the effect. I won't put lace on David's piece, although that would be kind of funny. This is the week to finish these up so they can be shipped next week. Then, I am officially done with shopping. Sometimes I regret wanting to be done so soon. There can be some really good deals later in the month as merchants try to woo you into the store. But, I rather like being able to sit back and relax during this time, to wander about because I want to, not because I have to get something for my brother because I got his name in the family drawing. Once these are done, I can look ahead to next year and what projects I might like to actually finish.